I never really wanted to be an expert at head lice, LOL. Apparently I didn't think of that when I decided to become a school nurse. The past 15+ years has given me more experience working with families who are dealing with head lice then I ever wanted. I have seen every trick in the book tried for head lice and I know the best way to get rid of head lice. I know if you are reading this post you are probably dealing with these pesky little critters and you need some solid advice from someone who has seen it all! First off let me say….take a deep breath. It really is true that anyone can get head lice. ANYONE. It doesn't say anything about you or your family. Lice are friendly and like to find new homes unfortunately. Sometimes even if you follow all of my tips to keep your kids from getting head lice at school….it will still happen. 🙁 It will be OKAY. When you first find out someone at your house has head lice you need to kill the live lice. The quickest way to do this is to use a lice shampoo like Nix or Rid. These shampoos do a decent job of killing the live bugs. They DO NOT do a good job of killing the eggs. I repeat….do NOT believe the labels because studies show that the claims are overrated. NOW….some parents do not like using these strong chemical shampoos on their kids and I totally understand that. You can shampoo your child's hair like normal and while in the shower comb the hair with the water running through it so the bugs will hopefully wash down the drain and out of the hair. This is where you are going to really dislike me…..there is no quick way to get rid of head lice. The BEST WAY TO GET RID OF HEAD LICE IS TO PICK EVERY SINGLE NIT OUT BY HAND. There…I said it. You have to do the hard work and pick every single egg out by hand. If you really, truly want to be rid of these bugs it will take hours and hours of picking. You need to go through the hair in tiny segments. Basically looking at every strand of hair. You need to pick the eggs out yourself—pulling them off the hair shaft with your finger nails. Remember—they are cemented onto the hair shaft. DO NOT RELY ON LICE COMBS. The plastic combs that come in the lice shampoo boxes are TRASH. They are a complete waste of time. They can catch a bug, but do very little good on the eggs. The only lice comb that I have found to be effective is the Fairy Tales Terminator. It does a really good job, but you have to spend the time to learn how to use it properly. Here is a good video that can help you. This is where people fail at getting rid of head lice. They stop. They do the work the first day or two and they don't see anything else in the hair. Thinking they got all the lice gives them that home free feeling. WRONG. Almost every time the child will end up with lice again in 2 weeks. They missed ONE or TWO eggs….those hatched and BAM—back to square one. It is IMPERATIVE that you keep checking the hair EVERY SINGLE DAY for 2-3 weeks. I don't mean scan the hair. I mean do a THOROUGH check through every strand of hair. It is amazing how easy it is to miss one or two little eggs. Cleaning everything in the house is secondary to picking out all the eggs, but it is still important to hit the high points. Head lice can't live long if they aren't on a human host. Focus your attention on the areas that your child's head has been in contact with recently. The bedding and recently worn clothing are good places to start. Wash these items and dry on HIGH HEAT of at least 130 degrees F. Vacuum the house and furniture and be sure to throw away the vacuum bag or empty the container. Stuffed animals can be bagged up for 2 weeks in a sealed bag. Don't overlook hair brushes, combs, barrett's, headbands, etc. These should be soaked in very hot water for 10 minutes or run through the dishwasher. I have given you the best way to get rid of head lice, but I have a few more tips that will be helpful. 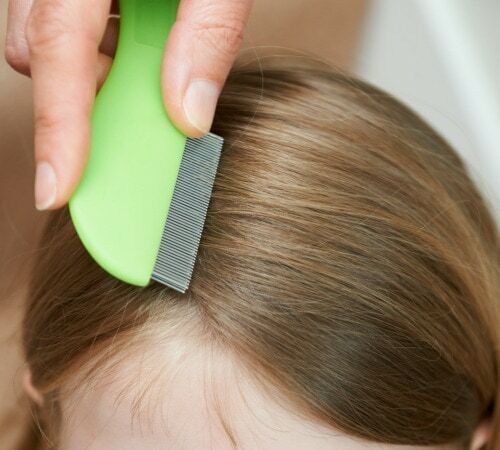 Checking your child's hair for lice should be a weekly or biweekly occurrence if your kids ever leave the house. 🙂 Catching lice early will make getting rid of them easier. Don't forget to check everyone in the house. Parents can get lice from their kids. Have your kids spent the night anywhere—those people deserve to know about the lice too. Go over my tips for keeping your kids from getting lice at school and TEACH your children preventative measures. Dealing with head lice can be traumatic for a family. If you follow these suggestions it won't last forever and life will get back to normal. Picking nits out of hair won't be your evening fun forever. Has your family had to deal with lice? What method worked best for you? What do you think is the best way to get rid of head lice.